We attempted to clone candidate genes on 10p14–15 which may regulate hTERT expression, through exon trapping using 3 BAC clones covering the region. After obtaining 20 exons, we examined the function of RGM249 (RGM: RNA gene for miRNAs) we cloned from primary cultured human hepatocytes and hepatoma cell lines. We confirmed approximately 20 bp products digested by Dicer, and investigated the function of this cloned gene and its involvement in hTERT expression by transfecting the hepatoma cell lines with full-length dsRNA, gene-specific designed siRNA, and shRNA-generating plasmid. RGM249 showed cancer-dominant intense expression similar to hTERT in cancer cell lines, whereas very weak expression was evident in human primary hepatocytes without telomerase activity. This gene was predicted to be a noncoding precursor RNA gene. Interestingly, RGM249 dsRNA, siRNA, and shRNA inhibited more than 80% of hTERT mRNA expression. In contrast, primary cultured cells overexpressing the gene showed no significant change in hTERT mRNA expression; the overexpression of the gene strongly suppressed hTERT mRNA in poorly differentiated cells. These findings indicate that RGM249 might be a microRNA precursor gene involved in the differentiation and function upstream of hTERT. Telomerase, which adds repeated telomere sequences to chromosome ends, is a ribonucleoprotein enzyme that includes an endogeneous RNA (hTR) which acts as a template and a reverse transcriptase (hTERT), and are crucial molecules [1–4]. Telomerase activity has been detected in immortalized and tumor cells and its strong expression represents an important difference between normal and cancer cells . Although it is thought that telomere maintenance is predominantly due to telomerase activity [6, 7], which is mainly regulated by hTERT expression in the presence of hTR [8, 9], some gaps exist in the steps between immortalization, carcinogenesis, and cellular senescence . Therefore, these unknown steps must first be fully identified before translational applications are possible [11–13]. As several reports have indicated that human chromosome 10p carries a set of genes involved in regulating telomerase activity [14–16], we performed microcell-mediated chromosome transfer, radiated microcell fusion, and bacterial artificial chromosome (BAC) transfer assuming loss of heterozygosity (LOH), and examined telomerase expression in transfectants to determine whether hTR- and hTERT-regulating genes are located on 10p15 . After we determined the telomerase regulatory regions on chromosome 10p15.1 using DNA markers, we confirmed that the chromosomal fragments containing the regions induce senescence in the transfectants [18, 19]. We then identified that radiated chromosomal fragments containing D10S1728 (a genomic region on chromosome 10p15) induced senescence in transfectants, and performed the sequencing of 3 BAC clones containing D10S1728 [20–22] (data not shown), exon trapping using the BAC clones [23–25], Northern blotting, and RT-PCR before cloning several full-length genes. One of the genes we cloned was named RGM249 (RNA gene for miRNAs which was 249 bp in length), and showed stronger gene expression in cancerous lesions than in normal liver. We used the RNA interference (RNAi) method, which is a sequence-specific post-transcriptional gene silencing mechanism triggered by double-stranded RNA (dsRNA), to cause degradation of mRNAs homologous in sequence to dsRNA and to effectively inhibit gene-specific expression . Because dsRNA transfection is a common strategy for suppressing genes of interest, the small interfering RNA (siRNA) technique is an excellent gene-specific method for determining the function of the targeted gene by inhibiting its expression [27–30]. After focusing on RGM249 (RGM: RNA gene for miRNAs; 249 for 249 bp) among the genes cloned on 10p14–15 for further analyses, we examined the telomerase regulatory function of RGM249 using the overexpressing cassette and the gene-specific siRNA. In this report, we present a summary of our cloning research and introduce functional analyses regarding the identified gene regulating hTERT mRNA. We investigated the 3 BAC clones using a sequence-tagged-site marker (D10S1728) by PCR, based on previous reports [18, 19]. From these studies, we determined that the 3 BAC clones (M-6, H-11, and J-21) contained D10S1728. Approximately 90%~95% of the BAC clone H-11 sequence and supercontig were determined (studies were performed by the University of Colorado Cancer Center Sequencing Core). D10S1728 was regarded as the sequence on 10p15.3. We reconfirmed that the sequence and supercontig were derived from the original BAC clones by Southern blotting and PCR, and 20 exons were thereafter identified (fig 1-(a)). We performed a computer analysis for each contig, and the endosequences of the 3 BAC clones and the exon sequences we trapped showed that they closely overlapped each other (fig 1-(b)). Schematic diagram showing the chromosomal location (10p15.3) of exons including RGM249. (a) Mapping of exons trapped between 10p15.1 and 10p15.3. Reference was used as an assembly database. This region does not contain any known genes except GATA3. Solid arrows indicate both ends of the sequences which BAC clones cover and show that 9447200 links to 9447201 in NT077569.2. 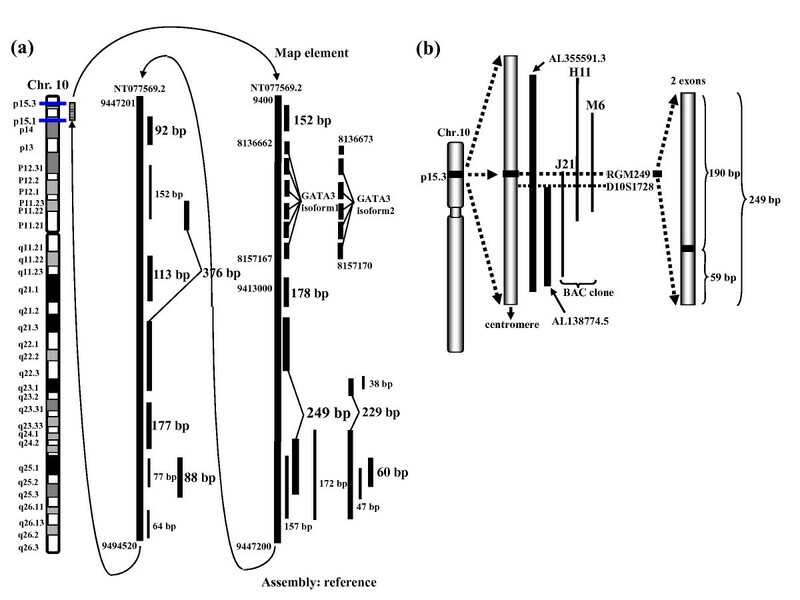 (b) Schematic diagram showing the chromosomal location (10p15.3) of RGM249, which consists of 2 exons, genomic fragments (AL355591.3 and AL138774.5), and a genomic marker (D10S1728) containing the gene and BAC clones (H-11, M-6, and J-21) used for the mapping. The full length of the gene is 249 bp. Solid and dashed lines represent the exons trapped and their neighboring gene (GATA3), respectively. Using a probe against each exon sequence (47–376 bp), Northern blotting was performed, which demonstrated that several exons showed a very faint signal (data not shown). In particular, a very faint single hybridization signal in human Multiple Tissue Northern (MTN) blot (Clontech) migrating at about 250 bp was determined for RGM249. One-step real-time RT-PCR showed a very low expression rate, that is, less than 20,000 copies per 50 ng of total RNA extracted from human organs (fig 2-(b)). In normal liver, approximately 60 copies per 50 ng of total RNA of transcripts were expressed. 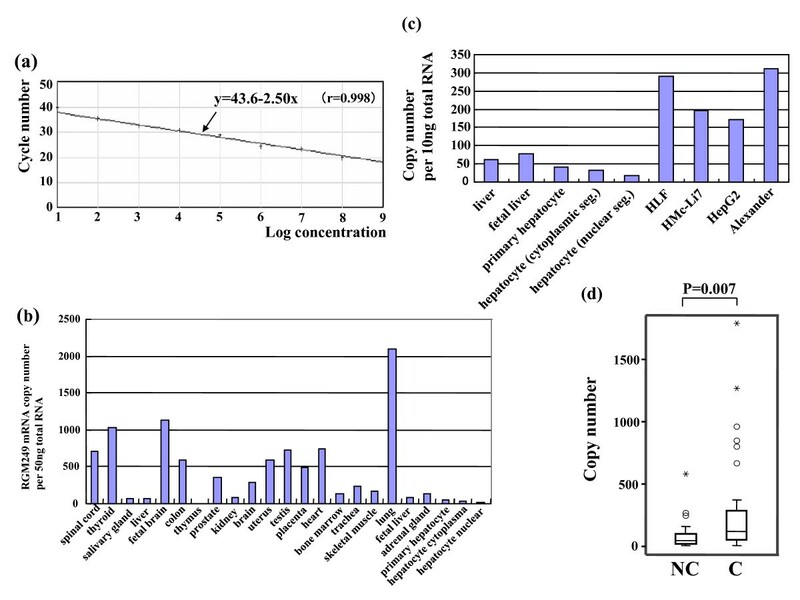 In contrast, the study on human primary hepatocyte cultures, including nuclear and cytoplasmic compartments in 4 hepatoma cell lines (HepG2, Huh7, HMc-Li7 and Alexander), indicated that hepatoma cells expressed RGM249 at much higher levels than normal human hepatocytes (fig 2-(c)). In 39 hepatomas, the expression rate was higher (mean ± SEM: 609.2 ± 261.5 copy number per 100 ng/μl) than in the 35 adjacent noncancerous lesions (138.9 ± 46.5) (P = 0.007 by t-test and P = 0.040 by paired t-test) (fig 2-(d)). A quantitative estimation in normal cells, cancer cells, and tissues. To quantify RGM249 mRNA expression in hepatocytes, hepatoma cells, and liver tissues, the copy number in 10 ng of total RNA was evaluated. (a) One-step real-time PCR was performed based on the linear correlation (P > 0.990) of the RNA controls. (b) RGM249 mRNA expression was examined in human representative organs using one-step real-time RT-PCR. The vertical line shows the copy number per 50 ng/μl total RNA (c) RGM249 mRNA expression in liver-related cells (from the left: adult liver tissues, fetal liver tissues, primary cultured hepatocytes [T], cytoplasm segment of primary hepatocytes [C], nuclear segment of primary hepatocytes [N], HLF cells, HMc-Li7 cells, HepG2 cells, and Alexander cells). (d) RGM249 mRNA expression in surgically resected liver tissues containing 33 pairs of hepatomas and adjacent noncancerous tissue. C: cancerous lesion, NC: adjacent noncancerous lesion. Cancerous lesions showed a significant upregulation of RGM249 mRNA, compared with noncancerous lesions, as determined by the t-test (P = 0.007) and paired t-test (P = 0.040). Box represents 95% confidence intervals. 5' and 3' RACE was performed using liver c DNA libraries (Clontech). Screening of the cDNA libraries yielded a clone with a full sequence length of 249 bp. A comparison of the cDNA sequence with the genomic sequence from H-11 revealed that the gene of interest was extended across 9 kb. The cDNA named RGM249 consisted of 2 exons and the RNA was not poly-adenylated (fig 1-(b)). The sequence with about 40% of the GC ratio is shown in fig 3-(a), indicating that this gene might be a noncoding RNA (ncRNA) gene, as shown in fig 3-(b). PCR-Single Strand Conformation Polymorphism (PCR-SSCP) and sequencing showed that the gene had no mutations other than a one-base addition at the last site of exon 1 in 10 normal liver tissue samples (10%; 1/10) and no mutations in 4 tumor cell lines (0%; 0/4). Although the cDNA showed no homology with either additional human loci except for the endogeneous locus, or mouse genome, the miRNA predicted to be digested from RGM249 by Dicer matched at least 3 miRNAs in the miRNA database (miRBase; mature miRNAs or stem-loop sequences) http://microrna.sanger.ac.uk/sequences/search.shtml. Although their functions remain unknown because we have not fully clarified whether RGM249 is actually processed by Dicer in vivo, given that it can be processed by Dicer in vitro. On the other hand, a motif search predicted no motifs in the RGM249 gene. Because this gene generated no protein, the secondary structure of RGM249 was drawn based on the structure provided at http://www.tbi.univie.ac.at/~ivo/RNA/ (fig 3-(b)). Moreover, because the full-length RNA was digested by Dicer enzymes, 20–23 bp sharp bands could be observed, indicating that nucleotides generated from RGM249 RNA may be miRNAs (fig 3-(c)). Outlines of cloned RGM249, a possible miRNA precursor or telomerase regulated gene. (a) RGM249 sequence is shown, and the sequences used for the siRNA and shRNA designs are underlined. (b) Predictive secondary structure of RGM249 was drawn by Vienna RNA Secondary prediction and comparison http://rna.tbi.univie.ac.at/cgi-bin/RNAfold.cgi. Bold line corresponds to the sequence used as the most functional siRNA or shRNA. The underlined parts show the sense and antisense sequences generating shRNA. Star (⋆) shows deletion of T or C in mt-1RGM249 or mt-2RGM249, respectively. (c) From the digestion by RNase III (Dicer), RGM249 mRNA generates 3 products ranging from 17 to 23 bp, suggesting that this gene may function as a noncoding precursor RNA gene which produces miRNAs. Sequence data have been deposited with the EMBL/GenBank Data Libraries under accession no. EF433558. In many hTERT- or hTR-regulating molecules reported previously, only two factors, hTERT and ribosomal protein L22 (RPL22), were transcriptionally suppressed in the hepatoma-derived cell lines (HLF) transfected with full-length RGM249 dsRNA (fig 4-(a)). To reconfirm the findings in dsRNA method, the siRNA method was performed. Results showed that their expressions were suppressed in HLF cells transfected with Stealth siRNA ① (fig 4-(b),(c)). Expression of telomerase-related genes in RNAi methods. (a) Inhibitory effect of full-length RGM249 dsRNA (100 nM dsRNA) on the transcriptional expression of telomerase-related genes in a hepatocellular carcinoma cell line (HMc-Li7) as determined by RT-PCR. RGM249, hTERT, and RPL22 were significantly suppressed. The lower blotting demonstrates gene expression using a transfection reagent without dsRNA. (b) RT-PCR showing the inhibitory effects of RGM249-specific siRNA on RGM249 mRNA, hTERT mRNA, and RPL22 mRNA in HLF cells, which express RGM249 mRNA in 4 hepatoma cell lines in the strongest manner. siRNA ① and siRNA ② correspond to those in Table 2. (c) Quantitative evaluation of the suppressive effect of siRNA in which the measurement, in the case without siRNA, was regarded as 100% for standardization (N = 5), suggesting that siRNA ① has a functional sequence. RGM249 siRNA transcriptionally suppressed more than 80% of hTERT expression and approximately 50% of RPL22 expression. RGM249 mRNA, ▯ hTERT mRNA, RPL22 mRNA. d) Quantitative evaluation of the inhibitory effect of RGM249 shRNA on RGM249 mRNA, hTERT mRNA, and RPL22 mRNA. From left, transfection using only transfection reagents, LacZ shRNA as the gene control, wtRGM249 shRNA, and mt-1RGM249 or mt-2RGM249 shRNA with a different mutation (a nucleotide T or C) in the functional sequence. A total of 5 transfections were performed and data were statistically analyzed using the Mann-Whitney test. Compared with LacZ shRNA, RGM249 and mt-1RGM249 shRNA significantly suppressed hTERT mRNA (P = 0.002 and P = 0.034, respectively). mt-1RGM249 and mt-2RGM249 correspond to those in Table 2. ▯ RGM249 mRNA, hTERT mRNA, RPL22 mRNA, *: P < 0.05; **: P < 0.01. Quantitative evaluation of the suppressive effect of shRNA in which the measurement, in the case without siRNA, was regarded as 100% for standardization (N = 5). 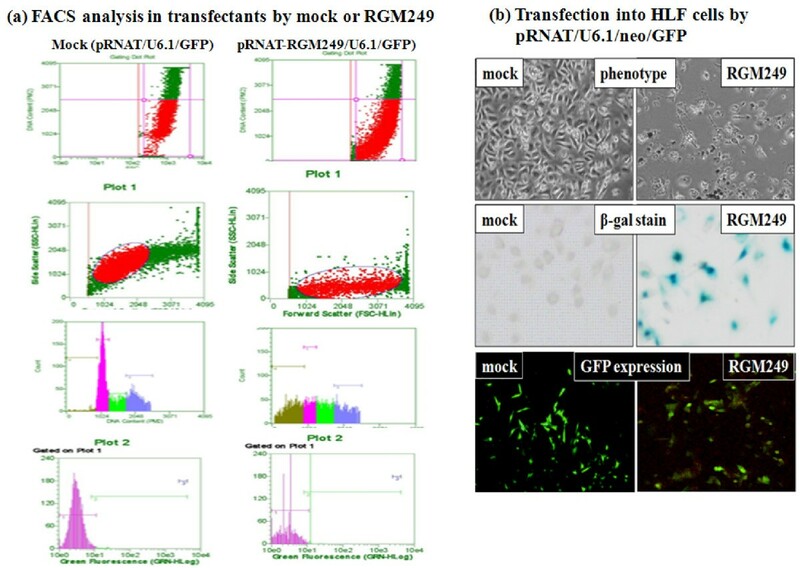 (e) Telomerase activity was quantitatively compared using image analyzer between transfectants with LacZ shRNA (in proliferative state) and RGM249 shRNA (in senesced state) and RGM249 shRNA, and was compared with the parental cells (112 and 54, respectively, which had an intensity of 100). Although the results depended on the timing of cell harvests after transfection, telomerase activity in transfectants with RGM249 shRNA was reduced to approximately half compared with that in parental cells, and we observed a periodicity of 6 bp due to reduced telomerase in the shRNA lane. NC: telomerase negative control. 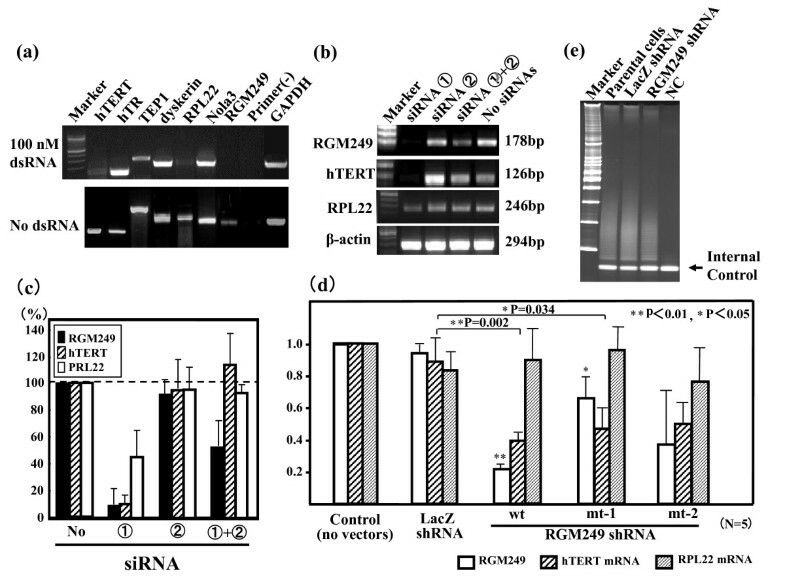 RGM249 siRNA suppressed more than 90% of hTERT mRNA, approximately 50% of RPL22 mRNA, and RGM249 transcripts (fig 4-(c)) unlike hTR expression. However, RPL22 expression in cells transfected with Stealth siRNA ① was weaker (50%) than in those transfected with full-length dsRNA (fig 4-(c)). siRNA ① + ② had less efficient knockdown due to the interaction between both siRNAs. These findings are consistent with our results obtained from dsRNA induction, an experiment performed under conditions of almost negligible cytokine storm. A similar result was obtained about 48 hours after transfection. Subsequently, we examined the inhibitory effect of shRNA transfection. Compared with LacZ shRNA, we found that RGM249 shRNA and mt-1RGM249 shRNA significantly downregulated hTERT mRNA (P = 0.002 and P = 0.034, respectively, using the Mann-Whitney test; fig 4-(d)). Otherwise, no significant differences were observed, except for the effect on RGM249 mRNA. Similar to transfectants that received RGM249 siRNA, telomerase activity in transfectants with shRNA was suppressed in the same manner as mRNA expression, compared with that in transfectants with LacZ shRNA (fig 4-(e)). Telomere length was not measured due to the small number of cells available and the relatively short observation period. No immunoreactive effects on tumor cell proliferation resulting from cytokine storm were recognized in the GE profile by microarray analysis, which resulted in IFN-β being downregulated twofold. FACS analysis and phenotypes in transfectants by RNAi methods. (a) FACS analysis showing induction of more than half of the transfected populations into the preG1 phase of the cell cycle. As shown in the upper two parts, the increase in apoptotic cells in transfectants by RGM249 is shown as red circled areas. DNA content analysis revealed in the lower parts, that early cells showed typical cell proliferation profile, cells later in production showed reduced cell proliferation, and later cells also showed early signs of cell death (sub-G1), in both transfectants. In the bottom parts, the histogram with gating and the threshold were set properly for correctly stained cells in a clean machine. The large pink peak represents the green light signal from cells. The line segment flanking the peak is the gating band for cells. (b) Changes in phenotypes of HLF cells receiving LacZ shRNA or RGM249 shRNA are shown. The upper, middle, and bottom part shows the phenotype of transfectants, the result of β-Gal staining as an indicator of senescence, and EGFP expression as evidence of successful transfection, respectively. At 2–3 weeks after transfection, the transfectants were induced to undergo apoptosis (upper and bottom parts) through senescence (middle part) in the presence of both a selectable marker (neo) and RGM249 (data not shown). LOH in human hepatocellular carcinoma (HCC) is rare, except at 10q26.11-qter, which is observed in 25% of HCC cases (32). However, relatively frequent alterations and deletions of chromosome 10p have been identified in human tumors, including glioblastoma multiforme (GBM) and malignant melanoma [33, 34]. In GBM, 3 common distinct regions of chromosome 10 deletion have been frequently identified; one of them is the distal half of the short arm [15, 35], indicating that several distinct tumor suppressor genes may be present on chromosome 10 and may contribute to the progression of malignant tumors. Structural alterations have only been observed in malignant melanoma (10p13-pter), gastric cancer (10p15), and GBM (10p14-pter). Unexpectedly, RGM249 with low GC ratio on 10p15.3 is potently miRNAs-generating gene, as well as cancer-related gene. A representative gene expression in microarray analysis. Representatives of regulated genes using microarray analysis performed between transfectants with LacZ shRNA and RGM249 shRNA are shown as a gene symbol (description) and ×fold. Following transfection of the RNA generating-vector and presumably the generation of RNA molecules, many transcriptional factors, the molecules involved in RNA biogenesis, and tumor-related genes altered the expression level. miRNA is physiologically generated by both Drosha and Dicer. We can not digest RGM249 mRNA by Drosha because Drosha protein is now unavailable commercially. RGM249 RNA processed by DICER, results in at least 3 small fragments of a product (17–23 bp) related to RNA species (fig 3-(c)). 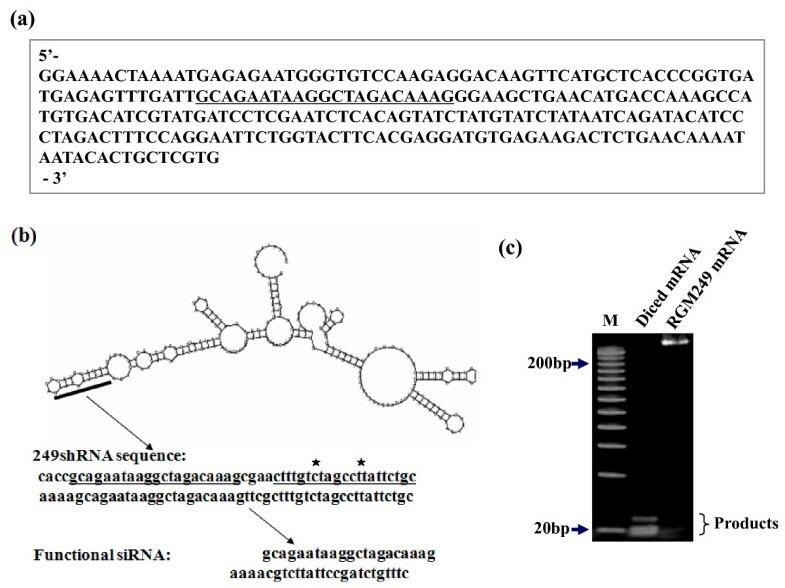 The sequencing of diced RGM249 mRNA proved that the sequence we used for siRNA or shRNA was included in fig 3-(b). Because the silencing of RGM249 induced the downregulation of hTERT expression, this gene may be involved in the oncogenic mechanism. In humans, ~800 miRNAs are predicted to exist ; each of these is thought to have hundreds of targets, suggesting that miRNAs play a critical regulatory role in cellular protein expression . In various human cancers as well as in developmental timing and patterning, differentiation, organogenesis, and stress response, alterations of miRNA profiles have been observed; these miRNAs may act as oncogenes, leading to the specific dysregulation of their target gene transcripts [41, 42]. Although alterations in miRNA expression have been described in cancer and may contribute to other disease states, it remains unclear what drives these alterations. Our findings might pave the way for defining unknown crucial roles that miRNAs located around this locus play in oncogenic regulation through hTERT regulation and, in particular, the role RGM249 may play during this process. Although the way in which RGM249 regulates hTERT remains unidentified, the physiological expression of RGM249 synchronizes the upregulation of hTERT mRNA, and its excess expression using the RNA-expression vector downregulated hTERT in specific cancer cells. Moreover, its siRNA or shRNA suppressed hTERT. Taken together, RGM249 may function negatively or positively, reversibly or indirectly on unknown mediators upstream of hTERT. Using microarray analysis between transfectants with RGM249 siRNA and those with LacZ siRNA (fig 6), the comparative expression analysis demonstrated that ATM and TP53LP were upregulated, although p53 status (the presence of mutation) in each cell line did not correlate with hTERT mRNA expression, and Ras and several transcriptional factors were downregulated. As described in fig 6, RGM249 may have direct effects on several transcriptional factors. Rapid stress induced by siRNAs may induce upregulation of genes participating in both repairing action and apoptotic or growth inhibition induction. Comparative proteome analysis would be useful to explain the detailed mechanisms underlying these processes. The overexpression of RGM249 in normal cells did not alter hTERT expression level, suggesting that RNA-related molecules may be functionally different in normal cells and de-differentiated cells, and that a key molecule for uncovering the oncogenesis mechanism or a potential factor which could be applied as a therapeutic target may exist in the genome. The findings that both the overexpression and dsRNA knockdown of RGM249 suppressed the expression of hTERT are problematic. In addition, this gene may be indirectly associated with hTERT because its overexpression may not always reveal a normal function and RGM249 microRNAs are not predicted to bind to hTERT even with the use of available bioinformatics. Moreover, this gene is not mutated or homozygously deleted even in HCC cells and tissues. Based on the Celera assembly, it seems to have one base (T) addition at position 188 of the first exon, however, single nucleotide polymorphisms are not specific to cancer. Additional experiments such as promoter analysis are needed to elucidate the epigenetic network in which this gene works. This novel noncoding gene is strongly expressed in poorly differentiated tumor cells. The genes (mRNAs) targeted commonly by both miRNAs and siRNAs in our study were MAPK6 and PRKCA, which can induce hTERT upregulation (fig 7-(a)). Representative genes (mRNAs) targeted by miRNAs with expression upregulated more than twofold by shRGM249RNA included DICER1, high mobility group A2 (HMGA2) and GAS7, as well as hsa-miR-let 7b, 7d, 7e, 7f, and 7g targets. In particular, RGM249 might be implicated in oncogenic transformation through the inhibition of HMGA2 interacting with let-7 miRNA (fig 7-(b), (c)) . RGM249 was not detected in any 'mirtrons or polycistron' detection program, genome, or miRNA database (MiRscan, PicTar, miRanda, etc.). We are now considering MED18 as a key molecule obtained from microarray analysis (fig 6 and 7) . The mediator head module stimulates basal RNA pol II transcription and enables transcriptional regulation. The head subunits MED8, MED18, and MED20 form a subcomplex (MED8/18/20) with 2 submodules. The highly conserved N-terminal domain of Med8 forms one submodule that binds the TATA box-binding protein (TBP) in vitro and is essential in vivo. Beyer et al. reported that the downregulation of another mediator complex (MED28) expression in NIH3T3 cells results in a significant induction of several genes associated with smooth muscle cell (SMC) differentiation and functions as a repressor of SMC differentiation . A mediator complex is essential for transcription induced by pol II in eukaryotes and is required for the recruitment of the transcription machinery after chromatin remodeling . MED18 may also be involved in the repression of differentiation, transcription, and telomere elongation. 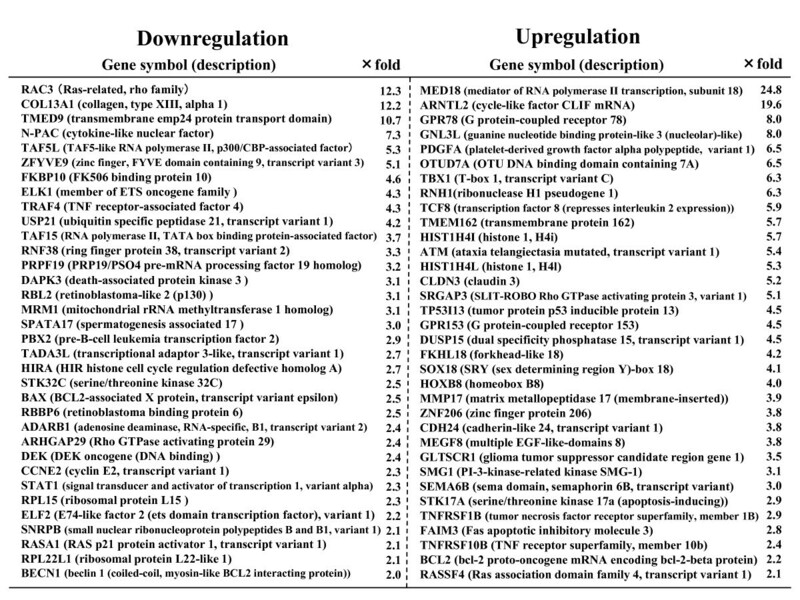 Microarray analysis revealed a strong upregulation of MED18 (×24.8), the RNA polymerase II mediator which functions as a coactivator involved in transcription regulation in nearly all RNA polymerase II-dependent genes, and other RNA-related or DNA-binding genes were upregulated (fig 6). 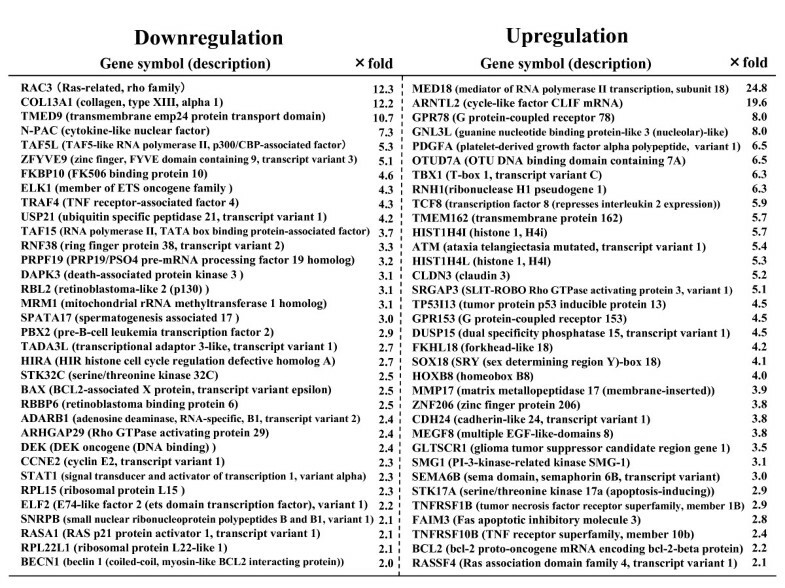 In transfectants with MED18 siRNA, both RGM249 and hTERT mRNA were significantly upregulated (Supplement fig 2-(d)). MED18 siRNA transfected into A172 cells significantly upregulated hTERT mRNA and RGM249 expression (Additional file 1-(d)). Co-transfection by both MED18 siRNA and hTERT siRNA upregulated only RGM249 mRNA, suggesting that RGM249 may functionally locate upstream hTERT mRNA, and MED18 may closely interact with RGM249. Overexpressing RGM249 is carried out for the purpose of comprehending the possible suppressive effects of miRNAs and depleting RGM249 is performed for the purpose of understanding the physiological function of this gene. Our results suggest that RGM249 may not be a precursor gene such as Onco-miR but is a Suppressor-miR and might function to lower differentiation in its expressing cells by suppressing cell growth as an independent response to hTERT expression. 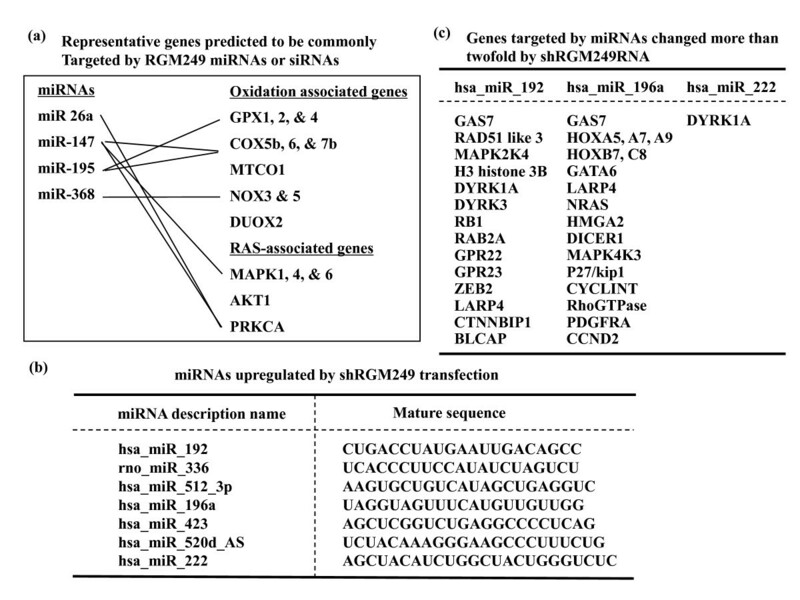 A representative miRNA expression in microRNAarray analysis and predictive target genes. (a) Representative genes predicted to be commonly targeted by RGM249 miRNAs or siRNAs are shown. 4 miRNAs were predicted from the RGM249 sequence by miRBase http://microrna.sanger.ac.uk/sequences/index.shtml or miRNAMAP http://mirnamap.mbc.nctu.edu.tw/html/search.html and it was predicted that the miRNAs might inhibit the translation of genes involved in oxidation and RAS activation. As reported previously in association with hTERT expression, PRKCA, MAPK1, and AKT1 were included in the targeted genes. (b) Seven miRNAs upregulated more than twofold in RGM249 shRNA-transfectants by microRNAarray analysis performed between transfectants with LacZ shRNA and RGM249 shRNA are shown. Some of these 7 miRNAs have been indicated in the oncogenesis of oral squamous cell carcinoma (unpublished data). (c) Representative genes targeted by miRNAs which changed more than twofold when induced by shRGM249RNA are shown. The genes were predicted mainly using miRNAMAP. Three miRNAs were presumably targeted towards miRNA processing proteins, transcriptional factors, telomere-related genes, TERT-related genes, tumor suppressor-related genes, and cell cycle-related genes. Taken together, the enhanced cell death in RGM249 transfectants likely resulted from an hTERT-independent mechanism or the presence of a mediator with crucial responsibility for oncogenesis, arguing that some other targets instead of hTERT might be the real players mediating these contradictory oncogenic and growth suppressive functions. It should be noted that mRNA studies do not always reflect processes at the protein level of gene regulation. Further studies will be required to investigate these expression levels. Several ncRNAs in the exons we trapped might provide new insights into the coordinated and dynamic mechanisms of development, stress, transformation, and (de)differentiation, resulting in the possible prevention of oncogenesis and suppression of tumor progression. BAC clones (H-11, M-6, and J-21) were selected on the basis of results from a previous experiment (Research Genetics, Toronto, Canada) . BAC DNA was isolated using a modified alkaline lysis protocol . Pulsed-field electrophoresis analysis of the isolated BAC DNA was performed using the CHEF DRII system (Bio-Rad, CA, USA). Purified BAC DNAs were shared using the AERO-MIST nebulizer (CIS-US, Bedford, MA, USA) and after ligation of adapters, these DNAs were subcloned into the BstXI sites of pSHOT II, which was constructed by subcloning the BstXI sites from pcDNA II, prior to the disclosure of the endosequences of the 3 BAC clones (M-6, H-11, and J-21) (fig 1-(b)). A sequencing library was generated by sonicating BAC and cloning it into a phosphatased EcoRV site in Bluescript; initially, each clone was sequenced using Phil Greene's Phred and Phrap programs. For all exon trapping experiments, we used the exon-trapping system kit (Gibco-BRL, Gaithersburg MD, USA) and the supplements recommended therein. We shotgunned M-6, H-11, and J-21 into pSPL3, employing BamHI and BglII or BamHI, BglII, and PstI for 2 ways of cutting BAC DNA using restriction enzymes. This method was performed as described previously . Thereafter, the BAC whole sequence or cDNA sequence was identified using a database http://www.ncbi.nlm.nih.gov/. In 1999 to 2005, the sequenced reference human genome draft was not definitely determined on 10p14–15 and altered several times during this interval. The probe, consisting of the respective exons, including two exons forming RGM249, radiolabeled by random priming using the Radprime kit (Gibco-BRL), was incubated with human multiple tissue northern blot (Human 12-Lane MTN Blot) (Clontech, Mountain View, CA, USA). One-step real-time RT-PCR experiments were performed using Human Total RNA Master Panels (Clontech) according to methods we previously reported using LightCycler (Roche, Basel, Switzerland) . The primer sequences used are shown in Table 1. Each quantification was confirmed by sequencing with high reproducibility (for RGM249; fig 2-(a), r = 0.998, for hTERT) . Using the exons identified by Northern blotting or RT-PCR, we amplified cDNA fragments from human skeletal muscle and liver "Marathon-ready" cDNA, according to the manufacturer's protocol (Clontech). Amplicons were subcloned into the pcDNA3 vector (Invitrogen, Leek, The Netherlands). A comparison of cDNA and genomic sequences revealed a total of 20 exons and detected 3 alternative splice donor sites for 6 exons. To screen for point mutations in trapped exons, we performed PCR-SSCP assays using flanking intron primers, as previously described . To confirm telomerase activity in transfectants after siRNA transfection, a telomerase detection kit, TRAP-eze, (Oncor Inc., Gaithersburg, MD, USA) used for RGM249 cloning and the TeloChaser kit (TOYOBO, Osaka, Japan) used for the expression analysis of shRNA transfectants, were employed for the telomeric repeat amplification protocol assay according to the manufacturer's protocol. Quantification of TRAP was estimated using an image analyzer (CS Analyzer 3) provided by ATTO Corp. (Tokyo, Japan). To examine whether RGM249 can generate a protein, we performed an in vitro translation assay according to the manufacturer's instructions (Clontech). After examining the motif and homology http://www.ncbi.nlm.nih.gov/genome/seq/BlastGen/BlastGen.cgi?taxid=9606; http://hmmpfam.ddbj.nig.ac.jp/; http://blast.ncbi.nlm.nih.gov/Blast.cgi), we predicted the secondary structure of RGM249 using the Vienna RNA Secondary prediction and comparison program http://www.tbi.univie.ac.at/~ivo/RNA/; http://www.genebee.msu.su/services/rna2_reduced.html). Subsequently, we screened the micro RNA) (miRNA) database among species. To confirm whether the RGM249 gene functions as a miRNA precursor gene, we digested the full-length RNA with a Dicer enzyme using a Dicer siRNA generation kit according to the manufacturer's protocol (Gene Therapy Systems, Inc., CA, USA). To confirm the transcriptional level (copy number) in human organs, liver-related normal cells, and immortalized cells, we performed one-step real-time RT-PCR using human hepatocytes (KAC, Kyoto, Japan), hepatoma cell lines (Tohoku University, Sendai, Japan), and 74 surgically resected liver tissue samples, including 33 pairs of hepatomas and corresponding adjacent tissues. We measured each copy number 3 times and calculated the average. After ligasing a synthesized RGM249 (Operon Biotechnologies, Tokyo, Japan) into the pRNAT/U6.1/Neo/GFP vector (GeneScript Corp., Piscataway, NJ, USA) digested at the KpnI/SacI site, it was transfected into several cell lines (A172, T98G, HLF, HT1080, HeLa, SW480, Huh7, HepG2, HMc-Li7, KMST-6, SUSM-1, and NIH3T3), with NH-12 as senescence-programmed cell lines, and keratinocytes and TIG 1–20 as primary cells. Immortalized cells were transfected with FuGene (Roche, Basel, Switzerland) to obtain stable cells overexpressing RGM249. After enhanced green fluorescent protein expression in the presence of a neomycin-resistant gene in all cell types was confirmed, β-gal staining (Senescence Detection kit; BioVision, CA, USA) and RT-PCR were performed. Primary cultured cells were electroporated using Nucleofector technology (Amaxa AG, Cologne, Germany) under optimal conditions. At least 5 transfectants were examined in mock or RGM249 transfectants. The respective gene expression (GE) ratio to β-actin mRNA in mocks or RGM249 tranfectants was analyzed using the Mann-Whitney test. Between both transfectants, FACS analysis of HLF cells was performed using Guava EasyCyte Mini according to the manufacturer's instructions (GE Healthcare UK Ltd., Buckinghamshire, England). dsRNA derived from the RGM249 sequence was generated from the expression vector with RGM249 in the MCS of Litmas28i (NEB, MA, USA) using an in vitro transcription method (T7 RiboMAX Express Large Scale RNA Production System, Promega, Madison, WI, USA) and was transfected into 4 hepatoma cell lines (HLF, Alexander, HepG2, and HMc-Li7) at a concentration range of 10–40 μg/ml medium. Subsequently, to avoid unspecific inhibition of dsRNA through interferon (INF) activation [50, 24], stealth siRNAs were designed on-line using RNAi designer provided by Invitrogen (Tokyo, Japan). At the optimal concentration (25 nM) of siRNA to the recipient (HLF), which expresses it strongly, we repeatedly performed transfections to examine the correlation of telomerase-related factors (hTR, TEP1, dyskerin, RPL22, etc.) with RGM249 expression . The expression of telomerase-related genes was estimated by RT-PCR after transfection of dsRNA (fig 4-(a)). Expressing vector (Invitrogen) which was designed to generate shRNA in transfectants. To examine the effect on hTERT expression 7 to 10 days later after selection with 200 μg/ml Zeocin, an shRNA-generating lentiviral vector with the functional sequence of RGM249 (fig 3-(b)) was transfected. Since the mock of the lentiviral vector was linearized according to the manufacturer's instructions, we used transfection reagents without RNA and the vector, LacZ shRNA as the controls, and wtRGM249 or mtRGM249 (mt-1 or mt-2) with one base (T or C) deletion in the wtRGM249 sequence. We evaluated GE in the transfectants semiquantitatively. Stealth siRNA and shRNA sequences for RGM249 are shown in Table 2. Microarray analysis was performed for total RNA purified from transfectants with LacZ shRNA and from those with RGM249 shRNA following confirmation of the downregulation of both RGM249 and hTERT mRNA expression by RT-PCR after strict quality control in accordance with the guidelines of the Hokkaido System Science (Sapporo, Japan). Data for genes that had changed more than twofold were additionally analyzed using Gene Ontology Tree Machine http://bioinfo.vanderbilt.edu/gotm/ and typical GE changes are shown in fig 6 and the left fig in Additional file 2. miRNA array analysis was performed using the same samples as the microarray analysis samples (Filgen, Inc., Nagoya, Japan). The results are shown in fig 7(b) and the right fig in Additional file 2. Genes targeted by miRNAs were investigated using DIANA-microT, Pictar, TargetScan, and miRanda http://diana.pcbi.upenn.edu/cgi-bin/TargetCombo.cgi. Norimasa Miura, Reina Sato contributed equally to this work. This work was supported by a Grant-in-Aid from Takeda Science Foundation and by a Grant-in-Aid for Cancer Research from the Osaka Cancer Study Group. We thank Dr. Norimitsu Inoue and Dr. Zinne Andrew of the McDermott Center, University of Texas Southwestern Medical Center, USA, for screening the BAC library and Dr. Anthony P. Monaco for the kind gift of the exon-trapping vector. Cell lines used in this study were all provided by the Cell Resource Center for Biomedical Research, Institute of Development, Aging and Cancer, Tohoku University, Japan. All the PCR primers were designed by INTEC Web and Genome Informatics, Corporation (Tokyo, Japan). MN and SR carried out the molecular genetic studies. WJ and DH participated in the sequence alignment and drafted the manuscript. MJ kindly provided the exon trapping vector. SG kindly provided the clinical specimens. MN and VA participated in the study design and performed the statistical analysis. Other authors conceived of the study, and participated in its design and coordination and helped to draft the manuscript. All authors read and approved the final manuscript. All contributors who do not meet the criteria for authorship are listed in Acknowledgements.